Review by Laura Madsen, veterinarian, mom and writer. I grabbed SOMETHING ROTTEN as part of a one-dollar-to-fill-a-bag book sale at my library and I’m glad I did. I probably wouldn’t have read it otherwise, and it’s definitely worth reading. Have you read or seen Shakespeare’s HAMLET? It’s always been one of my favorite of his works: murder and mayhem and everyone dead at the end. 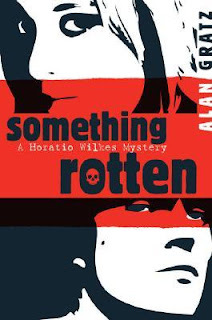 Alan Gratz takes the general plotline and characters from Shakespeare, but puts them in modern Tennessee and makes them uniquely his own. The novel is told in the first-person by Horatio Wilkes, loyal friend of Hamilton Prince, the heir to the Elsinore Paper Plant fortune. Something is rotten in Denmark, Tennessee, where the Elsinore plant is spewing toxic gunk into the Copenhagen River. Hamilton has been broody and depressed since the death of his father, Rex, and his mother Trudy’s abrupt remarriage to Rex’s brother, Claude. As the story begins, two of Rex’s guards show Hamilton and Horatio a security video of Rex, looking pale and, well, ghostlike before his death, accusing Claude of murder. Horatio sets out to solve the mystery of Rex’s death, clean up the river, and save Hamilton and Olivia (a smart, modern, non-insane Ophelia). The Denmark community theatre is putting on the play Rosencrantz and Guildenstern are Dead, which provides the perfect opportunity for Horatio and Hamilton to catch the murderer. The gang’s all here from HAMLET, but with modern sensibilities and vices. Hamilton’s a hard-drinking private school teen, Olivia is an environmentalist trying to stop the pollution of the river, and Roscoe Grant and Gilbert Stern are a couple of abrasive, videogame-playing hicks straight out of The Dukes of Hazzard. Alan Gratz also adds a few new memorable characters. If you like Shakespeare or mysteries, this is a fun, quick YA read.